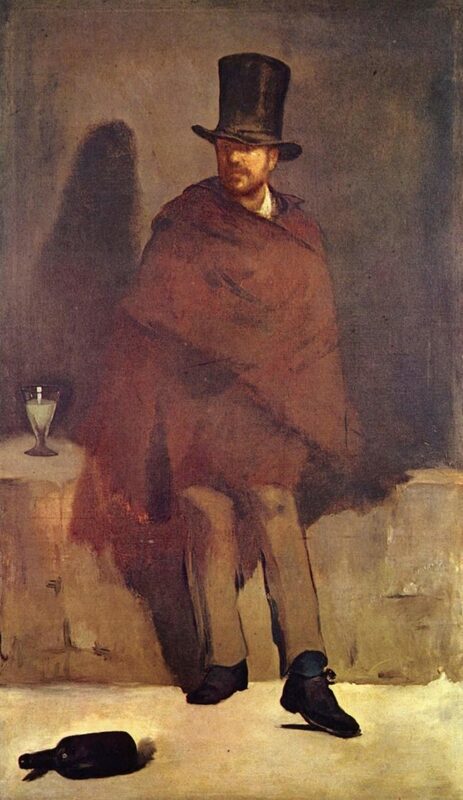 There is a print that has followed me around for more than 30 years, from house to house, country to country and that is the much loved, hauntingly sad, L’Absinthe by Edgar Degas. To be able to see the real thing in the Musée d’Orsay still thrills. Degas painted L’Absinthe between 1875 and 1876 and showed the painting in 1876 to dreadful and scandalized reviews. 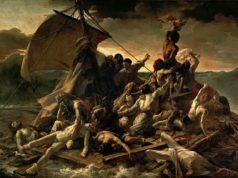 Its realism was criticized as “ugly and disgusting” and the painting was put into storage until 1892. Hard now to believe that a painting of a couple drinking at a table was found to be so unacceptable and shocking, but the establishment, not only in France, did not want to confront the truth about absinthe– particularly of a woman drinking in a bar. 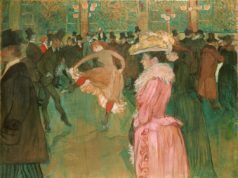 That the painting does not depict any kind of happiness or enjoyment in their situation– conversely it’s more a warning to the deadening effects of absinthe– has no importance. These people are not to be seen and certainly not depicted in a painting for all to see. The painting, with earlier titles of, ‘A Sketch of a French Café’, ‘Figures in a Café’ and ‘Dans un Café’ show a man and woman sitting side by side but otherwise apart in every other detail, a glass of yellow absinthe and carafe of water on the table in front of them. The couple are placed together to the right of the painting with no other figures in view. The man, to the right of the woman, is looking away from her. He looks little more than a tramp with a black hat pushed back from his forehead. His hair and beard are disheveled, his arms resting on the marble table with what looks like a glass of beer to his left. In contrast the woman is quite fashionably, but probably inexpensively, dressed in a cream blouse with ruffled neck and a hat perched quite upright on her red hair. (Red hair in the late 18th century was often used to denote a prostitute.) Only her white-bowed shoes, looking shabby, which help explain why she is sitting here with her glass of absinthe. It is the woman’s expression that draws you into the painting. It has been described as numbed by drink, but I don’t see that; her look of melancholy has more than a tinge of being numbed by despair and hopelessness rather than befuddled by drink. She appears to be staring at nothing, not her glass of absinthe, certainly not her drinking partner, but looking inwardly with a quiet resignation. And maybe that is the force of the painting; there is no movement from either of them, the stillness is all pervading. Their drinks are on the table in front of them but not drunk; indeed it is difficult to imagine them picking up their glasses at all. The woman, pretty and slim, was modeled by Ellen Andrée, an actress who had already posed for Degas in ‘The Plum’ and ‘Chez le père Lathuille’. 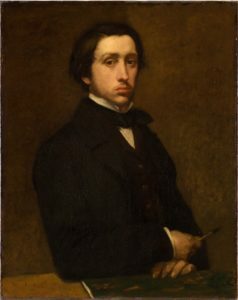 Marcellin Desboutin, a painter and etcher and friend of Degas, posed for her scruffy drinking partner. Again, I’m loathe to say partner, as for all the interaction between the couple, there could be a solid wall between them. They are both in their own separate worlds with perhaps alcohol their only thing in common. L’Absinthe was later shown in 1893 in the Grafton Gallery in London. It met with little enthusiasm, and critics once more found it shocking. The subject of absinthe in a painting was not a new one. In 1858 Edouard Manet painted ‘The Absinthe Drinker’. It was rejected by the Paris Salon as ‘morally degenerative’. Undeterred by Degas’ critics, Van Gogh painted ‘Still Life with Absinthe’ in 1887 and Toulouse-Lautrec, ‘Monsieur Boileau au Café’ in 1893. Viktor Oliva followed up in 1901 with ‘The Absinthe Drinker’. This was the first painting to confront the commonly held belief that absinthe was hallucinogenic. 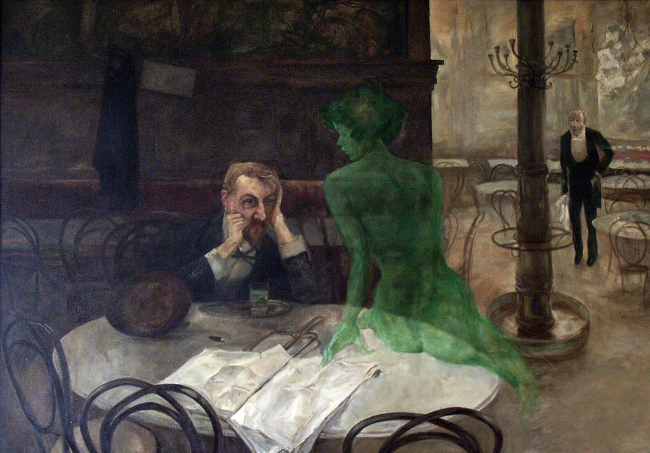 It shows a man with a glass of absinthe and a ghostly green woman sitting opposite him on the table. The drink by then was known as ‘la fée verte’ or ‘the green fairy’. Although the drinking of absinthe took off in a huge way in France from the mid 19th century (soldiers were given it believing it prevented malaria); it actually originated in Neuchâtel, Switzerland in the late 18th century. The anise-tasting alcohol was between 45-74% proof and was derived from botanicals, flowers, leaves and herbs including green anise and fennel and the leaves of Artemisia Absinthium (grand wormwood). Absinthe is naturally green and because of its high alcohol content and the fact that sugar is not added in the process, made it a spirit and not a liqueur. 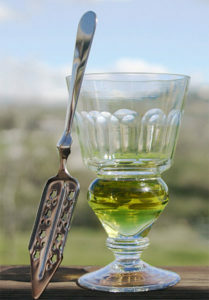 The French tradition of drinking absinthe was a masterpiece in detail: the absinthe was poured into a heavy, shaped glass and then a specially designed slotted spoon was laid on top. A sugar cube was then placed on the slotted spoon and iced water dripped over the cube. The ratio was normally one part absinthe to 3-5 parts water. The absinthe would then turn a cloudy yellowy green. Absinthe was widely produced throughout France, Spain, Portugal and Europe and the price came down dramatically. Easy to see why this cheap and potent drink became the favorite of not only the poor but also bohemians, artists and writers– especially in Paris. Easier perhaps to find an artist in the late 18th century who did not imbibe absinthe than those who did. 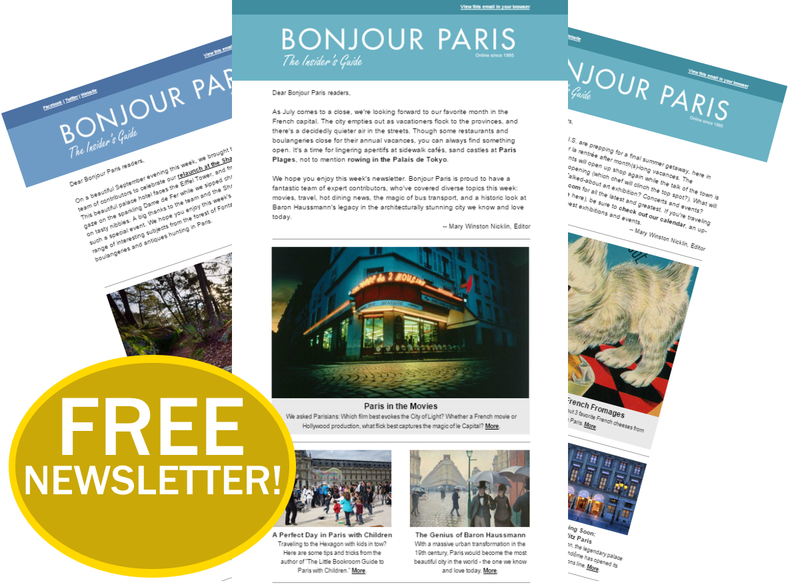 Toulouse-Lautrec was famous for his love of absinthe, as was Modigliani, Picasso and Van Gogh. Hemingway was known to take a drink or three as was Marcel Proust and of course Oscar Wilde. 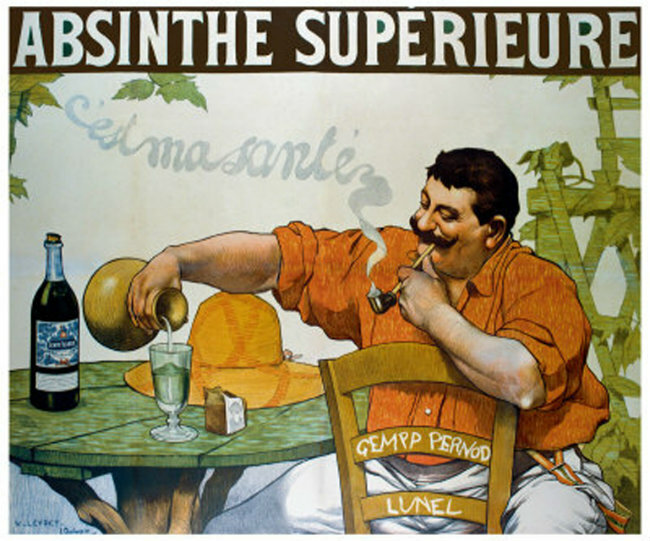 By 1915, absinthe had been blamed for making people crazy, provoking epilepsy and tuberculosis and was banned in the U.S., France and most of Europe. Recent scientific studies have dismissed nearly all of these claims, although the use of wormwood oil has been banned and the most likely culprit for any hallucinogenic experiences is believed to have been the unscrupulous addition of cheap, toxic copper salts to artificially induce a green tint. Absinthe has made a revival since the 1980s throughout Europe and the U.S., and although it will never be as popular as in the late 19th century amongst artists and indeed alcoholics, it’s good to have it back again. Well I’ll just have to read your book now-sounds fascinating-especially if you had to try out the variations of absinthe in the quest of historical accuracy of course!